Arlington is a beautiful, peaceful, buzzing city just to the west of Dallas, and it’s the home to many, many companies, entrepreneurs, and emerging talent. If you’re looking for office space for rent Arlington TX, then you might be surprised to see just how many options you truly have. However, you might find that many of these options don’t quite cater to your needs and wants. Here at NuvoDesk, we don’t want you to settle for a price tag you can’t afford or a lack of amenities. Instead, we aim to offer the best of both worlds: a plush place to call headquarters that doesn’t cost an arm and a leg. No More Hustle & Bustle in Finding Small Office Space. If you’ve been looking for a small office space for rent Arlington, TX, then you know just what that cost truly can be. Why pay that much in overhead and lose so much bottom line? At NuvoDesk, we want you to enjoy as much of your bottom line as possible while helping you grow your company. That’s why we offer contract-free, month-to-month options in a range of packages designed to suit various needs. You can cancel, upgrade, or downgrade at any time because you’re never locked in a lease! Arlington office space varies, and we know the struggle of trying to find the perfect small office space for rent Arlington TX. If you’re tired of trying to find an office space for rent Arlington TX that doesn’t require you to make a huge compromise, then we do have options available for you. At this time, we have a number of exciting Arlington office space options available, including coworking spaces in which you have your own dedicated desk; shared desk spaces for on-demand work needs; weekend-only spaces; and even executive areas where your team can enjoy a larger space all to yourself. We don’t stop there, though. 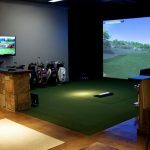 We also offer amenities such as a world-class eatery with gluten-free options, wine, and beer; private conference rooms; receptionist services; and a leading-edge golf simulator for when you’re ready for a breather. Yes, finding Arlington office space can be exhausting, but you need look no further. Contact the NuvoDesk team today to schedule a free tour of our facilities!